Delicate Fresh tasting Brazil Nuts coated in Dark Raw Organic chocolate. Incredibly creamy in taste, nutty yet light in texture. Ideal for snacking at any time - every bite is an unforgettable experience. 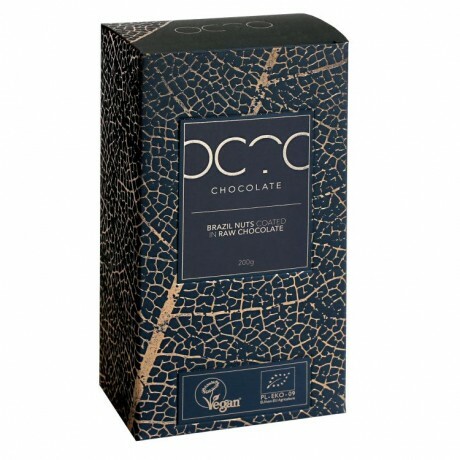 Made from carefully selected Unroasted Peruvian Trinitario cocoa beans sourced from Ecological/Fairtrade farming, and sweetened using only the best Coconut Blossom Sugar, which is one of the healthiest natural sweeteners available. Organic, Raw, Vegan, Dairy free, Gluten free, Wheat free, Free from soy lecithin. Brazil nuts* 50%, chocolate 50% (cocoa beans*, coconut blossom sugar*, cocoa butter*, Bourbon vanilla* - cocoa mass content min. 70%). * Ingredients from ecological farming. Allergens shown in bold. Warning: may contain other nuts causing allergy or food intolerance. Energy per 100g: 2635 kJ/637 kcal, Fat: 56g, of which saturates: 23g, Carbohydrates: 16g, of which sugars: 14g, Fibre: 10g, Protein: 11g, Salt: 0.1g.